This image may not be used to state or imply the endorsement by the Science History Institute of any product, service or activity, or to concur with an opinion or confirm the accuracy of any text appearing alongside or in logical association with the image. 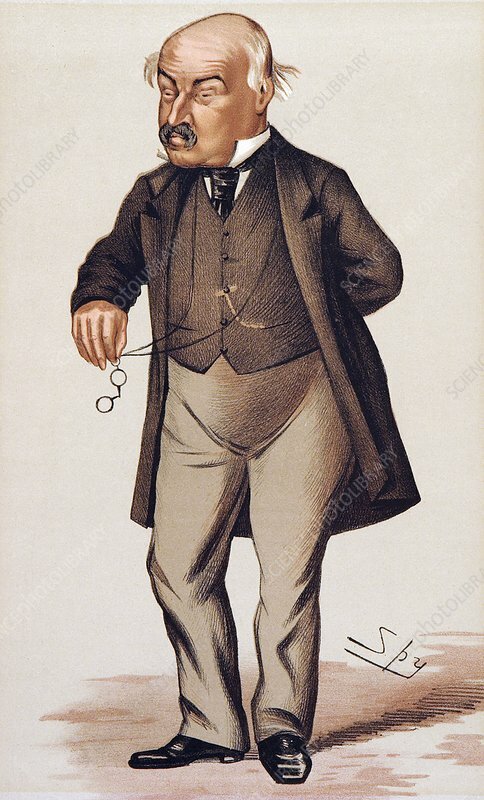 William Jenner (1815â1898), British physician, in a caricature published in the British weekly magazine Vanity Fair in 1873. Jenner studied medicine in London, where he worked as a doctor. His work distinguished typhus and typhoid disease, previously considered to be the disease named continued fever. He was appointed physician to Queen Victoria and her family in 1861, and he attended the Prince Consort during his fatal case of typhoid. Jenner, who acquired a large fortune from his lucrative practice, was elected Fellow of the Royal Society (1864) and made a baronet (1868). Artwork by Sir Leslie Ward ('Spy').